2012 was a great year for me from a professional standpoint. I’ve learned a tremendous amount. I was named an IBM Champion again and there is no actual hard proof that my code has crashed a server at the day job! 🙂 On a personal level I’ve made some great new friends. NotesIn9 really exploded this year. I think I previously tweeted that Ni9 produced 60 episodes – but that was incorrect. I forgot that I converted the 12 Extended Editions into the normal show number list. So the final tally is that Ni9 produced 48 shows for 2012. Still a great number I think. I don’t have a yearly hour count but total show time is up over 27 hours from 23 different contributors. And man the contributors are awesome! They make NotesIn9 what it is and I can’t thank them enough!! The power of the contributors was very evident when I did my end of year event called “Drive to 99”. In about 90 days, we added over 10 hours of content in 28 shows! That success was made possible by the people in this community willing to take time and share what they know. I believe 8 brand new contributors joined in for that event and it was wonderful to have them on the show. I talked to many others that were interested but just didn’t have time so hopefully we’ll continue to see new names in the future. The Drive to 99 event ended with a special show from IBM’s Dan O’Connor. That show featured the Domino Designer 9.0 Beta preview. That beta is available now for anyone that’s interested in it. That episode came out in the middle of December and has already been viewed/downloaded more then 1,000 times! Simply amazing! Introduction to XPages has been viewed/downloaded almost 13,000 times now! While obviously people are watching that more then once I continue to see new people coming to XPages and even new to Notes people coming on board. I see over 161,000 total views/downloads for all the NotesIn9 shows! Not too shabby for this little podcast that’s mostly focused on XPages. It’s kinda neat that Ni9 is being mentioned in a series of articles along side other podcasts. Here are links to those articles if anyone is interested. What’s next for NotesIn9 for 2013? I have a couple ideas but at the moment it’s hard to think past IBM Connect. I suspect Ni9 will be on hiatus until after IBM Connect. I’ll be blogging more on my sessions in a little bit. Once the conference is over we’ll see what the future brings and where the next road will go. Thanks for watching the show! I do really appreciate that and I always appreciate any feedback. 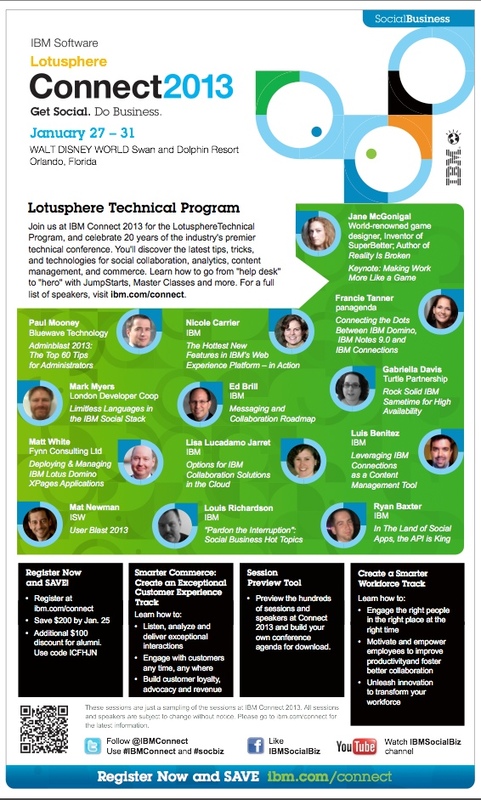 Here’s a really cool poster that IBM created for the upcoming conference. I’m really happy to see a bunch of friends highlighted here. This is it! The end of the road! This show concludes the NotesIn9 “Drive to 99” event. As I mention on the show, a huge thanks to all the contributors! Without them this wouldn’t have happened. I was especially excited to be able to add 8 brand new contributors as part of this event. Drive to 99 ran about 90 days and it added over 10 hours of new content in 28 shows. It exceeded my goals and hopes in every way. Special shoutout to Paul Calhoun who won the Most Valuable Contributor award!! Thanks Paul! In this show Dan O’Connor returns! Dan is the lead for the Domino Designer product and he will demonstrate some of the new features that are in the public beta that should be available for download on Dec 14th. I thought it was really appropriate to have a Designer 9 preview for the 99th show! I believe this is the first public look at the actual public beta code that will be released on Dec. 14th. Big thanks to Dan and IBM for allowing this to happen. In this episode Paul Calhoun returns with a great show on exporting XPages Data using the Apache POI project. There’s been some examples of how to export to Excel already on NotesIn9 but this is different. Apache POI is capable of making TRUE Excel binary files where the previous example relied on creating an HTML table for import. If you want to export to Excel or Word, this is the way to do it. This is show 98!!! It’s almost over! Tomorrow I’ll finish the DriveTo99 event with a very special and I think timely show. I’ll always be announcing an award on the show. Please don’t miss tomorrows 99th episode of NotesIn9! NotesIn9 97: Using jQuery in XPages to connect controls. In this show Russ Maher returns to give us a really cool lesson on jQuery. He’ll demonstrate how to use it to enhance your abilitity to do “Hide/When” on your web page based on the value of something like a checkbox or radio button. I know jQuery is something I want to get into a little more myself. IBM Champion and popular speaker Paul Withers returns to NotesIn9 with an interesting look at ways to bridge the gap with new XPages skills and classic Notes Client design elements. In this show he’ll demonstrate techniques on using Domino Designer to search and even replace classic design elements like forms, views, action bars and agents. UPDATE: Note in the show slides I mispelled Marks Contact information. His email is: m.leusink at linqed.eu and his blog is: http://linqed.eu I inserted a u after the q that shouldn’t be there. I’m excited about today’s show as I’ve been wanting to get this topic on for a long time. This episode also continues a string of NEW contributors to NotesIn9. I’m very pleased to welcome Sean Cull to NotesIn9. Today Sean will demonstrate how to install CentOS Linux and the Domino 8.5.3 server so you can have your own development environment. I’m a big fan of development environments. If you’re still developing on a production server you really should reconsider that. A good Dev server is worth it’s weight in Gold. Even though CentOS is techically not supported, it’s almost a perfect clone of Red Hat which is supported. Since CentOS is free, it’s a pretty good solution for a development server. I used to run this myself a long time ago. In this episode I welcome Serdar Besegmez, an IBM Champion and new contributor to the show. Serdar will come on to talk about DOTS. DOTS is way for you to create your own server tasks. Very fast and very powerful. While this topic is a little more on the advanced scale, I think Serdar has done an excellent job of walking through the concepts of DOTS and then showing how to setup your development environment and finally how to run it on the server. He highlights additional resources such as a Show-&-Tell from Lotusphere2012 and even shows a key tip on outputting messages to the console.